Magic is a game of flux, but there are some things that stay constant. One of these things is our evergreen keywords abilities and keyword actions which we use (almost) every set. But as you will see, even the evergreen items themselves can change over time. Today's article is a history lesson starting with the very first core set, Limited Edition (aka Alpha & Beta), and working its way to the last, Magic Origins. I will explain where each and every keyword started and, in some cases, stopped. Make sure you read to the end because the last core set has a few changes in store. Here's how this is going to work. I am going to list each core set in chronological order and list what evergreen keyword abilities and keyword actions appeared in it. I will then walk through what got added and what got eliminated and why. As you'll see, the evergreen keywords have gone through a lot of changes. If a core set didn't add or remove any keywords, I clump it with the set(s) before it. Well, everything, but let's go through them. Richard Garfield felt it was important to capture the sense of White's tiny creatures working together so he made this mechanic that let creatures band together on attacking and blocking. Some creatures are faster or have better range than who they are fighting and thus get to hit first. I'm pretty sure this is the very first keyword ability to ever exist in the game. This mechanic is better known by its most common forms: Islandwalk, swampwalk, mountainwalk, and forestwalk. All four of these were in Alpha. Plainswalk would not occur until Legends and appeared very infrequently. This ability represented a magical resistance to certain types of magic, usually related to color. The rules about how protection worked would radically change over time. This mechanic was made to convey size and force of an attacking creature. When the game began, you drew seven cards and then put the eighth card aside. The winner of the game would win the ante card from the opponent. Ante was never popular with the majority of the players and was quickly turned into an optional rule and was later removed entirely from the game. Some of you might be surprised that this keyword action goes all the way back to the beginning of the game. As you will see, it does leave the game for many years. Counterspells have been part of Magic from the very beginning.. This word shows up in Alpha but is kind of haphazardly used for a while. Many people think of Regeneration as a creature keyword ability, but technically it's a keyword action. I should note that how Regeneration worked when the game began and how it works now are very different. Back then you didn't Regenerate a creature until it was on its way to the graveyard. This shows up on just one card in Alpha, Demonic Tutor. Intrestingly, while Alpha only had one card that searched the library, it had three that shuffled it: Demonic Tutor, Natural Selection, and Timetwister. This is another key game term which was first introduced in Alpha but would take a while for its use to become uniform. Alpha did not yet have any kind of tap symbol but rather told you in text to tap things. For some reason we became very fond of keeping things from regenerating when they were destroyed (I attribute this to the popularity of the cards Terror and Disintegrate). So much so that we made a keyword action so we wouldn't have to spell it all out. Even though the card Sacrifice was in Alpha, the keyword action of sacrifice didn't show up until Revised Edition. This ability captures the flavor of things that require a certain environment, usually water in the form of islandhome. This ability existed since Alpha but was written out. In Fifth Edition, the decision was to finally keyword it. The vast majority of landhome was islandhome. Looking back, I'm surprised ante made it all the way through Fourth Edition. But come Fifth Edition it was officially purged from the game. This ability goes all the way back to Alpha (on Instill Energy and Nether Shadow—interestingly, neither are Red) but it wasn't until the Sixth Edition rules change that it got added as a keyword ability. One of the big things the Sixth Edition rules change did was to try to consolidate how card text referred to things. As such, a bunch of vocabulary was added and removed. The game had always had activated abilities, but it wasn't until the Sixth Edition rules that it got its own vocabulary word. This is another example of trying to bring language to a concept that existed but had never been spelled out before. The Sixth Edition rules clarified that there was a difference between a player looking at hidden information (usually something in a player's hand) and that player revealing it which meant that all players saw it. This distinction isn't important in a two-player game but matters very much when three or more players are involved. Also, the game would later care about things being revealed. Banding was flavorful and effective if used properly, but it was confusing. The story I always tell was about judging the 1995 World Championships, where the number one question I got from the top players in the world was "How does banding work again?" Sixth Edition was all about cleaning up a lot of things that had gotten messy over time and part of that was figuring out what could be weeded out of the game. We quickly came to our senses and realized that this ability just wasn't used enough to justify keywording it. We went back to writing it out and retired the keyword ability. One of the goals of Sixth Edition was to make it a better entry-level product. As a means to do that, we decided to take out two of the more complicated mechanics and make them just an expert expansion thing. In many ways, I never thought of this as these cards losing evergreen status, but I did want to reflect the change made at the time. One day, we said to ourselves, "Why do we hate on regeneration so much?" The whole point of it was to survive being killed, so why then did so many of our kill spells not allow it. Once we decided to pull back on how often we used the anti-regeneration rider, it became clear we didn't need the keyword any more. I should note that I still get people asking me to bring "bury" back even though we almost never used it. This was one of the odder choices made by the Sixth Edition rules. You no longer "cast" cards. You "played" them. As the word "play" was at the time the term for "battlefield," it caused a bunch of confusion—the word "play" meant a number of different things. Sixth Edition also retired some other words and phrases like "fizzled" and "summoning sickness" that spent years in limbo because no word had replaced them and the concepts were important. This ability goes all the way back to Alpha on the card Fear, an enchantment which grants this ability. This ability became commonplace enough that starting inOnslaught we introduced the fear keyword ability and it showed up in a core set for the first time in Eighth Edition. When the game began, the creature type Wall came with additional rules baggage. Walls could not attack. When Legends came out, a new creature type arrived with rules baggage, legend. Years later, Champions of Kamigawa had a legendary theme and the decision was made to turn the legend creature type into the supertype legendary. That left Wall as the only creature type with rules baggage, so the decision was made to keyword the "cannot attack" ability and make sure that all Walls had defender so that functionality wouldn't change. Ninth Edition was the first core set after that change was made. Once the keyword existed, it also allowed us to put the ability on non-Wall ceatures. Up until Ninth Edition, all Aura said "Enchant_____________" (where _____________ is what it could enchant) instead of "Enchantment." It was decided it would be easier for players to understand that Auras were enchantments if we stated it on the card type line. We then created the enchantment subtype Aura and created an ability which went on the card that then defined what could be enchanted. Mirrodin block introduced a new artifact subtype called Equipment and it was so flavorful and so popular, it went evergreen instantaneously. Ninth Edition was the first core set after Mirrodin. Equip is the keyword action like enchant that allows the Equipment to attach to creatures. They're back. Well back to core set status. We decided that it was better to have all the evergreen keywords in the core set and just put the more confusing ones at higher rarities. This is another ability that existed since Alpha (on Serra Angel) but took a while to get keyworded. It finally happened in Champions of Kamigawa and Ninth Edition was the first core set to follow. This ability was first used to allow Equipment to target creatures when being "put on." In trying to clean up Auras, it was important for enchantments to also have a word so it was decided to let Auras use the same word Equipment used. During Time Spiral design, I tried hard to push an initiative to turn instant into a supertype rather than a card type. Then any card that "could be played any time you could play an instant" would just get the instant supertype. It was a bit radical of a plan though and I couldn't convince enough of R&D to make it happen. In its place, we turned "This may be played anytime you may play an instant" into a keyword which could be put onto any permanent. Future Sight hinted at a lot of things from Magic's potential future on its futureshifted cards. I used this opportunity to do something I had wanted to do for a while. We were having some keyword issues so I turned a number of commonly used abilities into keywords and then spread them among more colors to help give design additional tools to make creatures (especially French vanilla creatures). For fun, I put these new keywords on futureshifted cards to hint that these abilities might be coming to Magic. That future was the very next set released, Tenth Edition. 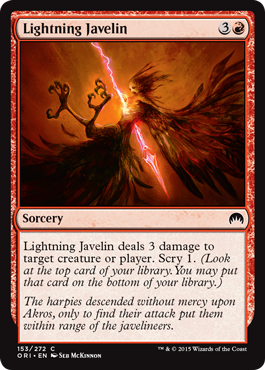 This ability can be traced back to the card El-Hajjâj in Arabian Nights, Magic's first expansion set. This ability traces back to Alpha and the card Giant Spider. (Winner of the Core Set Survivor Game—i.e., it was the card to appear in the most consecutive Magic core sets). This was originally not one of the abilities I asked to keyword in Future Sight, but keywording it made templating flying much easier so it also got added in. I originally included this on my list in Future Sight because I believed we could call it "untargetable," which I felt wouldn't be like adding a full vocabulary word, but I failed convince enough others of this plan and a different name was chosen. This ability got created with lifelink, reach, and shroud; but didn't manage to make it into Tenth Edition. It did though manage to make it in the next core set, Magic 2010. Technically, it gained evergreen status along with the others as far as expert expansions were concerned. Another terminology change was replacing the term "remove from the game" with exile. It was awkward that many cards that removed things from the game still interacted with them, which felt wrong if they were actually removed from the game. Fear had two strikes against it. First the word was awkward because you were making others scared, not being afraid yourself. Gaining fear implied the opposite of what the mechanic was doing. Second, for design purposes, it was important for us to spread out mechanics into secondary colors, and fear was a little too restrictive as it only really made sense on a black creature. We ended up making a replacement, but it didn't end up coming out in Magic 2010. We created this mechanic because we found players were having problems with shroud. They understood that their opponents couldn't target their creatures but didn't get that they couldn't either. The intuitive belief seemed to be that your abilities only help you and not hurt you. We saw enough players doing this during various phases of testing that we decided to change shroud into a keyword that acted the way players thought shroud worked. Obviously, adding hexproof meant shroud had to go. While we still support the keyword (meaning there are cards that do this and they still do it), we no longer use the keyword on new cards. This mechanic was first designed by a player turning in a card mechanic idea for the very first "You Make the Card" (for the card Forgotten Ancient). Green doesn't have first strike so the ability didn't fit for the card, but we really liked how elegant the design was and found a place to add it to Magic in Legions on two cards: Ridgetop Raptor and Rockshard Elemental. The ability was made evergreen shortly thereafter but it took awhile to finally make it into a core set. The indestructible ability was first created in Darksteel, but the word was used as a normal English descriptor rather than as a keyword. Enough players confused it with a keyword that we eventually decided to just make it one in Magic 2014. We also tried to turn unblockable into a keyword as it had the same issue, but because the ability is used with so many different variables, we weren't able to do it. We changed it from "unblockable" to "cannot be blocked" to make it feel and read less like a keyword. Intimidate was created as the fear replacement designed to fix the two problems of fear. First, its name implied it was scary and not scared. Second, the color mentioning was made self-referential so that it could be put on any color creature and feel appropriate. The ability, interestingly was first created in Magic 2010 but it didn't appear on any cards and was first featured in Zendikar. Magic 2014 was the first core set it was featured in. We had been searching forever for a way for green to deal with creatures in a way that felt green. We were hesitant to add more vocabulary words but found through testing that fight was so intuitive as a word that players correctly guessed what it did from the word alone. It was first added in Innistrad and Magic 2014 was the first core set to feature it. We wanted to get rid of intimidate (see below for the reasons why) so we went looking for a good replacement. We didn't have to look far because we actually had an ability we'd be using on and off since Fallen Empires. R&D referred to the ability as the "Goblin War Drums" ability as that was the card to first feature it. Rather than focusing on a characteristic of a creature which would vary wildly between decks, it focuses on how many creatures need to block it, something that can apply to most decks. The intent is for menace to fill the void being created by the removal of intimidate. This means it will be primary in black and secondary in red. You can see that we already made a little use of it in Dragons of Tarkir, just not with the keyword. For those that follow my blog, Blogatog, the need for blue to get a combat-relevant keyword that wasn't about evasion has been a recurring topic for years. In addition, blue-red is one of just a handful of color pairs (blue-black being the other big one) that doesn't have an overlapping keyword ability. 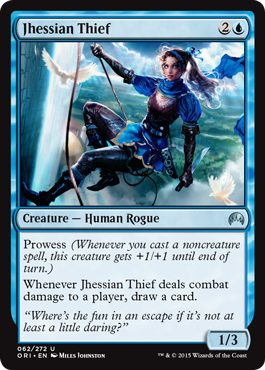 Prowess was just made to be the Jeskai mechanic in Khans of Tarkir, but the more we played with it, the more we liked its game play and realized its design potential. My favorite story about prowess comes from Shawn Main. Part of his duties is interacting with the team that does the market research, so he's always one of the first ones to see the data. Each set has two different waves of research: the first to gather first impressions, and the second to see how players feel after they've played with it. In the first wave of Khans of Tarkir, prowess was the lowest-rated faction mechanic. By the second wave, Fate Reforged, it was the highest. Erik Lauer first suggested making prowess an evergreen keyword. I said I was on board as long as the ability could be primary blue and secondary red (and probably tertiary in white). Erik said he was fine with it and voila, we finally have our much needed blue keyword ability. Scry was designed by Aaron Forsythe on his very first design team, Fifth Dawn, before he was even a member of R&D. Scry has always been a very popular mechanic, both inside and outside of Wizards. It does an excellent job of creating card flow and enabling sets to do whatever thing they're trying to do. After adding it to a number of different sets, the development team wondered if it would make more sense to make scry something we always have instead of something we occasionally use. Every set needs a card flow mechanic. Let's make sure we always have one available instead of having to constantly reinvent it. And like that, scry became an evergreen keyword action. Intimidate was made to fix one problem but ended up having a few problems of its own. Evasion based on color ended up making it a very swingy mechanic. Against some decks the ability is very strong, while against other decks the ability is useless. And that's a factor mostly outside of the player's control once they sit down at the table. In addition, we've avoided intimidate recently because it plays poorly with both multicolored environments and environments with a high colorless component. In addition, the mechanic has proved more confusing than we first thought. We tried it in Khans of Tarkir and found that a number of players didn't understand that a face-down morph creatures couldn't block a creature with intimidate. 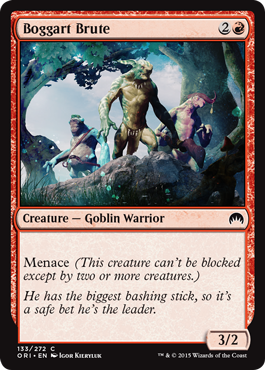 This mechanic has had a bullseye on its back for years, and once we stumbled upon the idea of upgrading menace to a keyword, we found that we just didn't need intimidate any more. Landwalk has many of the same issues as intimidate…but even more severe. What do you do against a landwalk creature if you're playing the appropriate land? Not play your basic lands? Magic games are best when there is some interaction, and landwalk was not clearing the bar. This last mechanic actually should have an asterisk next to it. Unlike intimidate and landwalk, it's not leaving as much as it's being downgraded. In fact, Magic Origins has one creature in it with protection. Moving forward, protection is moving from what we call evergreen to deciduous. It's a tool in our toolbox that we're allowed to use, but it's not something we expect to use in every set. Think of it as something like hybrid mana—that shows up from time to time in a set that needs it. It isn't, however, something you should expect to see all the time. And that's my little trip down evergreen lane. As you can see, Magic has gone through a lot of changes over the years, and Magic Origins is no different. I'm always eager to hear feedback on my columns, but I'm especially interested when I'm talking about changes we're making to the game. You can write to me through my email or any of my social media (Twitter, Tumblr, Google+, and Instagram). Join me next week when you'll all get board. Until then, may you enjoy menace, prowess, and scry. "Drive to Work #232—Dark Ascension, Part 4"
This is the fourth and final part of my four-part series on the design of Dark Ascension. This is the seventh podcast on my series on two-color pairs.